Making a splash from the moment it premiered, this sensational production of Singin' in the Rain is coming to Perth’s Crown Theatre from 31 December for a strictly limited season. As well as glorious songs including Good Morning, Make ‘em Laugh, Moses Supposes and the classic Singin' In The Rain, the movie's choreography is brought to life, and with the help of 12,000 litres of water, the audience can enjoy one of the most iconic dance routines live on stage. Showcasing the talents of GRANT ALMIRALL (multi-international productions of Singin’ in the Rain) and ROHAN BROWNE (West Side Story, A Chorus Line) alternating as leading man Don Lockwood, GRETEL SCARLETT (Grease, WICKED), JACK CHAMBERS the first winner of So You Think You Can Dance Australia and star of Hairspray, and ERIKA HEYNATZ (Legally Blonde, The Rocky Horror Show) are joined by leading lights of Australian stage, ROBYN ARTHUR, MIKE BISHOP and RODNEY DOBSON. 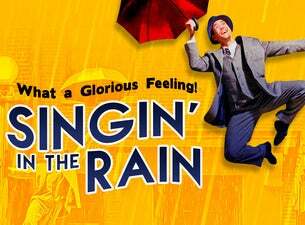 With its joyous story and sumptuous set design and costumes, Singin' in the Rain showers you with everything you could wish for in a hit musical! Patrons are advised that Mr Adam Garcia has withdrawn from the remainder of the Australian tour of Singin’ in the Rain due to injury.